You are currently browsing the Dublin Event Guide weblog archives for June, 2018. A busy weekend AND continued nice weather, how wonderful is that!? And the best news is that the longterm forecast even indicated good weather for NEXT weekend. Next weekend is the weekend of the City Specatcular (former Street Performance World Championship). This is a MUST GO event, so put it in your calendar. On the donation front it is now getting very serious! The bill for June is now down to EUR 140, but on Monday the July bill will be added to the outstanding amount and that means I have a bill of EUR 380 in front of me. It was never that bad before. :-O If at the end of July the bill is not cleared, I VERY RELUCTANTLY have to put the Dublin Event Guide “at risk”. Which means that I might to consider winding it down. :-( So I URGENTLY need to find money and I really really need your help! If you could support the Dublin Event Guide, I am suggesting a very fair EUR 12 for the year, that’s just 23 cent per Dublin Event Guide Edition or less than 3 pints for the whole year! That’s not much if you think about how much value the Dublin Event Guide brings you every week! ;-) Higher and lower donations are also appreciated! Every Euro counts! Feed the areas of your life you want to grow. Starve the parts that need to go. Eimear L, Brian R, Andrew G, Marta T, Linda C, Grainne F, Rita B, Rosemary K, Mary McK, Ger O’B, Alison J, Sinead L, Lesley C, Noel N, Majella M, Mona O’R, Leigh P, Eric C, Anette K D, Aoife G, Aidan C, George K, Rita B, Thomas G, Roy C, Jutta B-S, Lorna O’C, Aisling McK, Miriam L, Fergus O’T, Julia Sch, Helen B, Susan H, Paula R, Justin M, Tony B, Ross M, Daniel L, Susan F, Joan S, Rachel McG, John F, Ann Marie S, Melanie B, Magdalena H, Leigh Ph, Mark G, Joanne M, Louise F, Kathryn H, Ornaigh G, Eamonn U, Gerard Ph, Fiona F, Gabriel K, Laura C, Aislinn T, Barry M, Joan S, Nicole W, Tara R, Denise G, Ann M, Mairin M, Daire O’C, Anne H, Anne H, Comet Records, John F, Nora O’K, David O’K, Karen+Brian F, Estelle K, Ann McP, Noelle H, Pat M, Meav Ni M, Jutta B-S, Jamie C, Leigh Ph, Irene D M, Michael D, Joan S, Melanie B, Anita W, Maria F, Moira dF, Arthur D, Catherine G, Clodagh C, Elaine K, Majella M, Ann M, Clodagh O’C, Claire R, Leigh Ph, Sarah L, Mark G, Erzsebet H, Isidro G, Karen A, Sean S, Melanie M, Zelie McG, Lindsay R, Thibaut D, Pia O, James B, Marguerite D, Shai C, Susan K, Agnieszka S-S, Alice K, Ieva B, Ruth L, Ana RT, Rita B, Sueanne O’H, Rosemary M, Darragh D, Lorraine S, Helena S, Carija I, Pat McK, Jennifer R, Sophie P-L, Jenny B, Catherine F, Stephen S, Juliana A Y, Caoimhe NiM, Damien B, Shane O’B, Melanie S, Audrey H, Catherine E, Michele McN, Susan B, Sharon K, Bill G, Malachy B, Catherine O’S, Paula R, Pamela A, Eleonora P, Thomas B, Karen K, Brendan M, Eric O’F, Gale G, Daniel LG, Mark G, Margo C, Joan S, Debbie C, Karen McG, Eric C, Irish Family Names, Tom McM, Aishling B, Ana RT, Eamonn McG, Silja P, Nicola R, Jacinta O’B, Siobhan B, Orla P, Sharon G, Isidro G, Carmel C, Roisin R, Mona R, Suzanne D, Tracey O’C, Jessica G, Barbara L, Frances D, Emmet R, Irene C, Eugene McG, Stuart N, Laurie F, Joan S, Mark C, Clodagh O’C, Grace L, Peter D, Mona O’R, Maria J, Ryan M, Sharon B, Gennadii N, Tadgh C, Niamh D, Austin M, Belinda B, Brendan D, Cathie S, Margaret P and Travel Agency “Project Travel” (www.project-travel.ie Ireland’s only Norway and Northern Lights Travel Experts), Arthur’s Pub (www.arthurspub.ie A classic Dublin old-style pub in 28 Thomas Street with a new and buzzing music venue that runs lots of events), the Speedfriending Ireland Meet-up Group (www.meetup.com/Events-Drinks-Talks-Dublin/) (Where you can meet lots of new people and make friends), Cycling Campaign (www.dublincycling.ie), www.oliviercornetgallery.com (An Art Gallery in 5 Cavendish Row), www.thepaulkanegallery.com (A great Art Gallery, on the search for a new venue), www.cfcp.ie (The Centre for Creative Practices is the the only arts centre in Ireland dedicated to connecting, integrating and promoting immigrant, experimental and emerging artists among the local arts scene and audiences). Lots of events again this week! If you are in the area the Clondalkin Village Festival or the Tallafest might be interesting. There will be outdoor movie screenings in Dun Laoghaire and the HUGE Pride Parade is happening. From Monday 02 July until Sunday 15 July, Child Leap Card holders can travel free on all Dublin Bus scheduled services (excluding Airlink and Nitelink), all Luas services, all DART services, all Commuter Rail services in Dublin’s “Short Hop Zone” and Bus Éireann services where TFI Leap Card Validators are available. Child Leap Cards are available for Age 5-15 or Age 16-18 and for the “Kids GO Free” to work, the cards has to have at least 1 cent of Travel Credit. Every year, Dublin City Councillors elect a new Mayor and last week was that day again. This would be a relevant event in many cities around the world, but not in Dublin. The mayor of Dublin has a big title (“Lord Mayor”), but absolutely no power to change anything. He will move into Mansion House for the year, will cut ribbons and open shops and has the BIG job of turning on the Christmas Lights in December. Unless we get a directly elected mayor – and this should have happened years ago – he is just a figure head that we easily could do without. :-O Instead of a mayor, an unelected “City Manager” is running Dublin and he often even ignores what the Dublin City Council wants. “In the interest of the people” is different!! The new mayor is the 349th one. Mad! The name of the mayor is Nial Ring. Ring was part of disgraced Taoiseach Bertie Ahern’s inner circle in Fianna Fail for many years, but when his party didn’t want to support him when he wanted to be elected as a councillor, he suddenly became a “Independent” candidate. In 2017 he lost his house in Clontarf because he didn’t pay the mortgage payments and had arrears of EUR 500,000, so maybe he is lucky that he can move into Mansion House now. “Hosepipe Ban” – Are they for real?? When I read this, I thought it was a Waterford Whispers News story. (Waterford Whispers News is an Irish satirical news website that usually hits the nail on the head with their brilliant headlines.) The announcement that made me think it is a joke was the announcement by Irish Water on Friday that from Monday 02 July a “hosepipe ban” would be in effect in the Greater Dublin area. At first I thought it is Irish Water nonsense, but checking into it a bit more I realised that a piece of Irish Law really mentions that the “use of water drawn through a hosepipe” can be prohibited for the use of “watering a garden, watering recreational parks or sports grounds […], irrigating or spraying crops […], or washing a mechanically propelled vehicle or a trailer”. Water conservation makes sense if there is a shortage and due to the idiotic way public water supplies in Ireland are ONLY served from surface water in lakes and reservoirs (instead of using water from underground sources) we are currently entering a period of water shortage. BUT a “hosepipe ban” just sounds like a ridiculous piece of law. The ban will be in place for the whole month of July and if someone is found in breach of the ban, they could be fined EUR 125. While the wording above is taken from the “Water Services Act 2007”, Irish Water is NOT banning all wasteful water use. Instead they reduce the ban to “watering a garden, cleaning a private motor-vehicle using a domestic hosepipe. […], filling or maintaining a domestic swimming or paddling pool (except when using hand held containers filled directly from a tap), […]” so that means if you use a domestic hosepipe you are not allowed to clean the car, but if it is a commercial hosepipe, you can go ahead without any issues. It also means that your swimming pool must not be filled via hosepipe, but if there is a tap above the swimming pool OR if you get LOTS of big containers and fill it by hand, you are all above the law. An exhibition of horse traditions in Ireland will take place at the Phoenix Park Visitor Centre. This exhibition will look at how horses are used in a modern context and how they are linked to the Phoenix Park, including the Garda Mounted Unit which is based in Áras an Uachtaráin, the All Ireland Polo Club which is located in the Phoenix Park and the Equitation School of the Defence Forces based in McKee Barracks. A Summer Wellness / Yoga Event will take place every Saturday and Sunday at the Roundtower in Clondalkin. On 30 June Bennery Rickard will teach Hatha yoga. On 01 July Liz Costigan will run a Yoga class. Admission is free, buit donations to the teachers chosen charities are welcome. Elisabetta contacted me. She runs a community called “Revived Yarn” and they upcycle leftovers of yarn and make handmade garments for the homeless of Dublin, which are donated throughout the winter. On Saturday they are having a Yarn Party for the homeless of Dublin, in a special edition dedicated to the Pride Festival, to raise awareness among the participants on the problem of homelessness in the LGBT community. Admission is free. You can come to knit or only to find out more. Greg James and Chris Smith, two popular radio presenters from the UK, will in Eason on O’Connell St on Saturday to sign copies of their best-selling ‘Kid Normal’ books. The event is ticketed but the tickets are free and available to be booked at www.easons.com. The Facebook Page below doesn’t have many details and the inClondalkin.ie website still shows the information for the festival from 2017. :-O So the best way is to use the sketchy information above and then go to Clondalkin to find out the details. The Dublin Pride Parade is the culmination of the Dublin Pride Festival and it is a colourful, good vibes event that is for the LGBT community and everyone else. The parade will take a completely different route than in previous years, so do NOT go to the Garden of Remembrance!! Instead it will start at the Leeson Street side of St. Stephen’s Green with speeches and entertainment at 12:00 and then at 14:00, the parade will go along St. Stephen’s Green South, Cuffe Street, Kevin Street to Patrick Street, pass St. Patrick’s Cathedral and go towards Christ Church Cathedral. Then turn left into High Street and cross the Liffey at Fr Matthew Bridge into Church Street. The last bit is via King Street North onto Smithfield Plaza. Smithfield Plaza is were the Pride Village will be with more entertainment and food etc. In 2017 up to 30,000 people took part in the March and there were 60 floats, so this is a BIG event! After the Pride Parade all the usual LGBT venues (The George, Pantibar, Outhouse) and many other venues throughout Dublin will celebrate Dublin Pride with street festivals, gigs and parties. Not all are free, but if you check out www.dublinpride.ie/events/#30 for a full list, you will find all relevant details. Tallafest 2018 is taking place on Saturday. There will be a full and busy day with lots of activities with a Kids Zone, Create Zone, Sports Zone, Nature Zone, an Active Seniors Hub, Arts & Heritage Events, Exhibitions, Live Stage Performances and a Craft & Food Market. Admission is free and a full list of events can be found via the link below. Viribus Crossfit at Haymarket near Smithfield Plaza will host its first In House CrossFit competition to mark its one year anniversary. And you are invited to come and watch the competition. The competition will take place on Saturday and Sunday and admission as a spectator is free. The Discovery Gospel Choir is running a number of musical workshops this afternoon and will perform a concert this evening. Dun Laoghaire-Rathdown is inviting to a Movie Screening of three movies on Saturday in Moran Park in Dun Laoghaire, directly next to the dlr Lexicon Library. Admission is free, but seating is limited, so bring your own fold up chair of possible. The Wellington Weekender in the Workman’s Club on 29+30 June + 01 July will bring us a Flea Market on Saturday afternoon on the first floor and an acoustic stage on the Terrace, while the Banter discussion is going on in the Main Bar. The Wellington Weekender in the Workman’s Club on 29+30 June + 01 July will start on Saturday with the discussion event “Banter” with Paul Noonan from band Bell X1. The lead singer will talk about 20 years of life and music with Bell X1. Admission is free, but a donation of EUR 2 for the charity AWARE is expected. “Portraiture as Criticism” is a talk in the Farmleigh Gallery in connection with the current ‘Face to Face’ exhibition. Writer and Irish Times journalist Fintan O’Toole will be the speaker. Admission is free, but limited places available and Farmleigh House requested booking via farmleighevents@opw.ie Because there won’t be enough time to book from when you read this until the start of the event, I suggest that if you really want to attend the talk, you go to Farmleigh Gallery and check there if there might be still some space left. Since free events often have “no shows”, there is a good chance (but no guarantee!) that you will still get in. From around 15:00 until late there will be parties, gigs, street parties etc in many events throughout Dublin. A full list can be found via the link below. Not all are free, but some definitely are. The Albert Ross Foundation will play Classic Rock, Rhythm & Blues and Rock n’ Roll in the Bowery. The Wellington Weekender in the Workman’s Club on 29+30 June + 01 July will feature the Booka Brass Band on Saturday evening. A great band!! Guitar, cello and vocals duo LemonCello will play a gig in Sin E and they will be supported by 4-piece folk/jazz/pop band Stanlaey. Retro Fix will play a gig of Jazz / Funk / Soul / Rock in the Harbour Bar. Charles Cavanagh and band are performing classic Big Band, Swing & Ratpack favourites. High Definition will play a gig in the Bowery from midnight and admission is EUR 5, but there is an earlier gig of the Albert Ross Foundation for which admission is free. So you just have to come earlier and you should get free admission. Indie Rock band “Jogging” will play a gig and will be supported by the band “Shifting”. Rock Tribunal will be in the Portherhouse Temple Bar again this Saturday for a gig. All event details are on the website below. The Farmleigh Food Market at Farmleigh House will take place again this Sunday. Food products from around Ireland either to eat there or to bring home will be available. From approx. 14:00-16:00 the Clondalkin Youth Band will perform on the Bandstand in the gardens of Farmleigh House. The Drop-in family workshop “Clown Eggs” will take place in the atrium of the National Gallery. Join Louise McGrath for an art-making workshop inspired by the exhibition “Circus250: Art of the Show”. Children and their parents/guardians/carers are encouraged to work together on creative projects. Drop-in and stay for as long (or as little!) as you wish. The workshop is suitable for children of all ages. This year’s National Playday will be on Sunday in Merrion Square. There will be lots of opportunities to play for kids and youths and because some of the games can get a little messy, don’t wear the good clothes this Sunday. The day is a family friendly play day that is celebrated every year and it is a great day for kids, but you really have to wonder if the organisers (Dublin City, Department of Children and the Ombudsman for Children) are COMPLETELY out of touch with children. Read the theme of this year’s Play Day. It is “Celebrating 25 Years of Article 31; the child’s right to play”. Who came up with that nonsense? Admission is free and there is a good chance, but not a 100% guarantee that all events are free. The Toddler Yoga could cost a small fee. Nothing is indicated, but it also doesn’t stress that it is free, while it is pointed out for the Hip Hop Dance class. The Film Screening of “In the Name of Peace: John Hume in America” (2017, Dir. Maurice H. Fitzpatrick, 120 mins) will take place on Sunday. This film will be introduced and followed by a discussion led by the film’s director. Art historian Kate Drinane will show you a new perspective of the National Gallery. Spend one hour exploring the history of gender and seksual identity (Note: Spam Filter-sensitive spelling) through a selection of works from the collection that are connected to the LGBTQ community. ‘Fantastic Mr. Fox’ by Roald Dahl will be performed in the Walled Garden of St. Enda’s Park at 15:00 on Saturday. Admission is free. Suitable for the whole family. Bring a blanket to sit on the grass during the performance. Alice Jago & Jem Mitchel will play Roots Folk in the Harbour Bar. The National Gallery is running an Autism-friendly workshop for children on Monday in Room 20 of the Dargan Wing. Admission is free but booking is required via the website below. Places are limited. Only the child needs to be booked in. Parents, guardians and carers who wish to accompany their children do not need to reserve a space. The workshop is inspired by the work of Irish artist Harry Clarke and it is suitable for children of primary school age and will take place in a low-lit space that displays Harry Clarke’s beautiful stained-glass artworks. A Chinese Literature Reading Group will be launched in TCD and the first event will be an introduction to the female literary icon Eileen Chang. Admission is free, but booking is required via the link on the website below. The Urban Mojo Blues Band will be in the Leeson Lounge for a gig. The National Botanic Gardens run a “Kids Drop by Activities” on Tuesday of this week. “Conversations on Art” is an interactive tour that has been specially designed for people living with dementia and their loved ones. “Take a break from the everyday and enjoy an afternoon of conversations on art and life in general. Join us for a relaxing tea or coffee in the Silk Road Café before we take you on a tour of our beautiful collections. Limited to 10 Participants per tour. The Lunchtime lecture “William Burton Conyngham: Patron of the Arts in Georgian Ireland” will take place in the Irish Georgian Society. William Burton Conyngham (1733-1796), the leading antiquarian of his day, commissioned international artists to execute hundreds of drawings of Ireland’s ancient monuments which formed the most extensive collection of watercolours in eighteenth-century Ireland. He intended (in vain) to publish them in albums, but only Grose’s Antiquities of the 1790s partially succeeded in doing so. Dr Peter Harbison, a member of the Royal Irish Academy, is talking about William Burton Conyngham. Admission is free, but there are limited places. The lecture will start at 13:10 sharp. The Pop-up talk “Juno Confiding Io to the Care of Argus” will take place in Room 26 of the National Gallery in front of Claude Lorrain’s painting. Valerie Alexander will give this informal lunchtime talk. Meet in Room 26. The Instituto Cervantes’ Dublin Theatre Club is inviting to a play reading of two scenes and three one-act plays written by Mexican playwrights Emilio Carballido and Hugo Salcedo. The programme will include “La miseria”, “Dificultades” and “Soñar”, all three by Emilio Carballido; and “Nigeria está en otra parte” and “Vuelve el pájaro a su nido” by Hugo Salcedo. The Terns (birds!) have returned to the Dalkey Island for another season and the Tern Warden is inviting to a Tern Watch from Coliemore Harbour. It will happen on 03+10+17+24+31 July from 18:30-20:00. At this month’s Dublin event, Daniel Buckley, a former IWT Chairperson and current NPWS conservation ranger, will give a talk about Black Poplar conservation in Ireland. Daniel is enthusiastic about native tree conservation and has been doing his own research on black poplar which is Ireland’s rarest tree. The Kickbacks is a 4-piece cover band that plays a regular gig in the Mezz. The next Phoenix park Wednesday Walk will be “Butterflies of the Phoenix Park” and it will be a walk to look at different species of butterflies in Phoenix Park. Admission is free. The full programme brochure can be found here. The Talk “Another Little Trouble Over: the unique characteristics of the circus in Victorian and Edwardian Ireland” with historian Dr Richard McMinn will explore the unique characteristics of the circus in Ireland in Victorian and Edwardian times. It is part of the gallery’s programme of events inspired by the exhibition Circus250: Art of the Show. The film “Finian’s Rainbow” (English, 1968, G (181 min)) will be screened. Take a trip with Finian (Fred Astaire) to Rainbow Valley as he tries to magically multiply the crock of gold he stole from the Leprechauns. “East Meets West: Russia’s role in Ireland’s Future” is a political debate and representing the Russian Federation will be Ambassador Yury Filatov. Ireland will be represented by one of the key architects of the Good Friday agreement Dr Martin Mansergh. Admission is free, but there is a LOT of interest for this event, so you might want to check the Facebook Page and book a ticket there AND also arrive early on Wednesday. The organists of Saint Patrick’s Cathedral will perform music from Star Wars, ET, Independence Day and Jurassic Park on 4th of July. Admission is free and the concert is suitable for all ages. A donation for charity “Clowns without Borders” is appreciated. Tickets are however required and can be booked via the link below. The Jailbreak Open Mic Session will take place in the Patriot’s Inn. “Inspectorium: Teeth and Tusks” is a Drop-in activity for families. Do you know the difference between teeth and tusks? What are the different types of teeth that humans and animals share? Drop into the Discovery Zone to learn about this and more. “The Coëtivy Book of Hours, Polyphony in Paint” is a talk with Adrian Le Harviel, curator of British art and music historian, National Gallery of Ireland. “Responsible Innovation: The Fate of a Simple Moral Idea” is the title of the first keynote lecture about “Ethics in Research and Innovation” in the Long Room Hub. Speaker will be Professor Jeroen van den Hoven, Delft University of Technology. It will be followed by the lecture “Moving Beyond Privacy to Ethics in IT Innovation” by Professor Philip Brey – University of Twente. Admission to all lectures is free, but booking is required via the website below. International performer Mat Ricardo, The Gentleman Juggler, is the first man in history to put the tablecloth back on a set table and in this special talk and performance he will discusses and demonstrates his work. The event is part of the public programme of events inspired by the exhibition Circus250: Art of the Show and is taking place in association with Laya Healthcare’s City Spectacular. CoalTrain will play a Rock n’ Roll / Blues gig in the Harbour Bar. The Dublin Commissioner for Startups is inviting to the 1st Friday Brekkie, a talk and networking event on the first Friday of every month. This month Catherine Downes from Usheru, a software company that enables film distributors to connect their marketing to the cinema box office by creating a customised film website where cinema visitors can book tickets directly. After the event there will be further “First Friday” events in the Dogpatch Labs across the road and that event is listed separately in this Dublin Event Guide. The Hugh Lane First Friday Culture Club will bring you in July to see the exhibition “Just be yourself!” by Rachel Maclean with Logan Sisley. The Gallery’s First Friday Culture Club offers the opportunity for engaging with the Gallery’s education, collection, conservation and temporary exhibitions programmes in a fun and relaxed way. 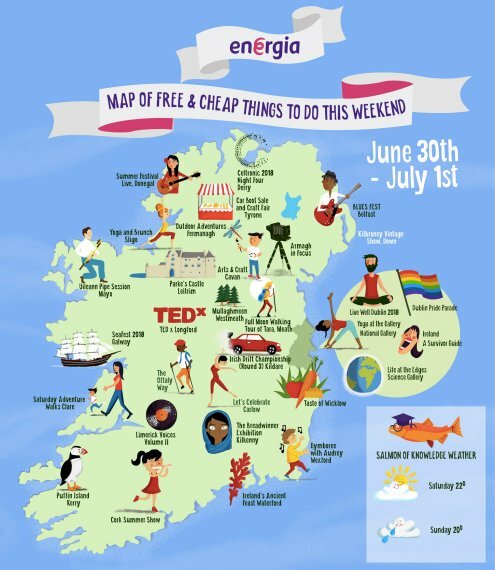 The best three festival in Dublin ever were the “Dun Laoghaire Festival of World Cultures”, the “Dublin City Soul Festival” and the “Street Performance World Championship”. For very different reasons, they are all gone and people that remember them have been around the houses for a while by now. But one of the three is luckily only gone by name and has survived many many great years and given us in Dublin SOOO Much entertainment over the years: The Street Performance World Championship lost the championship part, but is still with us as the “City Spectacular”, sponsored by Laya Healthcare. Thank goodness it is still around! And from 06-08 July it is back in 2018. In addition to the Street Performance LOTS of other components were added and I will give you some more details in next week’s Dublin Event Guide. This week, I just want to mention that the City Spectacular already starts on Friday with a number of Street Performance shows on two of the four stages. It will run from 12:00-19:30 and especially if you are not around on Saturday or Sunday, don’t miss this preview. There will be lots of street performers who will do their full shows on the “stages” in Merrion Square. From juggling via magic to acrobatics you will see outstanding performers. Admission to the whole event is free, but the performers are not paid and will hold their hat out at the end of the shows and you should reward their great work. The Pop-up talk “Michael Healy: Dublin Street Life and Stained Glass Artist” with Dr David Carson (Head of Visual Communication, NCAD) will discuss the work of Michael Healy in the exhibition Drawing Dublin. Meet in the Print Gallery of the National Gallery. First Friday for Startups is a regular meetup of members of startup companies in Dublin to connect, learn and grow together. + 12:30-13:30 Lightning Talks from Intercom, miniMAX and Google about finding talent, improving leadership strategy and developing company culture. Admission to this event is free, but registration for the individual events is required via the website below. “Data Ethics and CSO” is the title of thhis third lecture about “Ethics in Research and Innovation” in the Long Room Hub. Speaker will be Gemma Galdon Clavell – Universitat de Barcelona. Two other lectures “Responsible Innovation: The Fate of a Simple Moral Idea ” and “Moving Beyond Privacy to Ethics in IT Innovation” will take place on Thursday and are listed separately in this Dublin Event Guide. Andy Wheeler is a marine geologist on a mission to explore the deep ocean seabed and unravel its secrets. Our oceans cover over 70% of our planet’s surface, control our weather and climate, and produce 50% of the air we breathe — they are central to how our planet works and our existence, yet we have a very poor understanding of the oceans and have mapped only fractions of their depths. Join Andy on a journey to the ocean’s depths to explore life at the edge and re-evaluate your view of our planet. Hip Hop Brothers Charles & Andrew Hendy are T.P.M and they will be in Sin E for a gig on Friday. A DJ set with Post Punk Podge will follow the live gig. The Cosmic Funk Band is playing a gig in the Bowery from 23:30 and admission is free if you arrive before 22:00. Noise-pop quitet “Thumper” will play a gig in the Workman’s Club as part of the new OSLO III Friday night programme. The walks for July are not posted yet, but should be added on the sites above in the next few days. Thank you Michael D. Higgins, but it is enough! You might completely disagree with me, because for some reason Miggeldy Higens, as Irish President Michael D. Higgins is also known, found a large amount of fans in the last few years, but I think he should stick to his promise from 7 years ago, when he told the voters that he will only be available for ONE 7 year period. I was never a big fan of Higgins and it all come from one chance encounter a good few years ago when he was in a queue to go to an event I also went to. I won’t go into details, but let’s just say that he didn’t impress IN THE SLIGHTEST. Since then I encountered him at various events and he never managed to change my opinion. 7 years ago he promised that he wouldn’t be glued to the role and would leave after 7 years and while he hasn’t really done anything wrong in these 7 years, I would think that at 77 it is time for him to retire. But when I thought about it, I was reminded that the Queen is 92 or something like that and she has as much relevance in the day to day business of a country as Michael D Higgins. And the Pope is 81 and he is also still running his show. So maybe we should leave Higgins in Phoenix Park another 7 years? Also because we don’t really have someone other obvious candidate? You know what, the more I think about it, I don’t really care if it is him or not. But PLEASE no more of his own poems, they are awful!